The Social Psychology of Situation, Self, & Solutions. that parallel the principles of. Being Proactive means we are responsible for our own lives, to include the actions that we creatively initiate and the reactions we spontaneously have to circumstance. Dr Matt's new book "Changing Your Stripes" explains being "proactive" in terms of total, no-excuses, Response-Ablilty. Cause the Character of your Response. In response to the accusing query, "Who's to Blame?" . . . I've got two words: Wrong Question! If you ask a wrong question, . . . you will get a wrong answer! 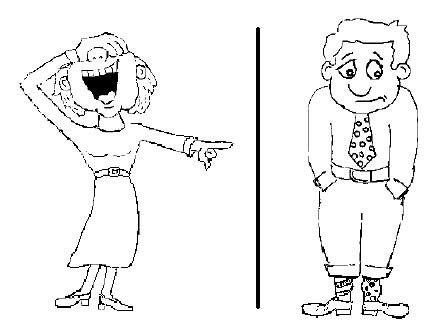 Trying to divide blame between mutually participating partners by percentage, 70-30 or 60-40, etc., may make the lower percentage partner feel better, but in the end, dividing blame is unhelpful, . . . it doesn't practically improve anything. Such thinking fosters an excuse-making mentality: "I may be bad, but at least I'm not THAT bad!" "If ya ain't got it in ya, . . . ya can't blow it out"
All "choices" flow from us according to the stature of our character, or lack thereof. For example: "Impatient people" CANNOT choose to be "patient" . . . under the press of a provoking situation. Their lack of "choice" in a moment of provocation is similar to a Skunk that sprays its Stink. It happens unthinkingly and spontaneously! BUT here's the good news: You can "determine" your propensity to be provoked tomorrow, by Changing Your Stripes today and becoming a person of high character capable of patient responses. Dr Matt's book captures Habit #2 this way: Begin by asking the Best Questions from the start! Which included questioning whether "the end" to which you aim is productive and important, and questioning whether the means by which you intent to reach that "end" is an adequate avenue. So, entering every issue with "the end in mind" is good, . . . but questioning and weighing whether "the end" we have in mind and the way to accomplish it, is a superior approach! but what you "think" you know, . . . that ain't so! In pursuit of the best solutions to Life's constraining conundrums, it is of paramount importance to pose the best questions from the get go. If the issues are not right and relevant, then the connected answers are as chaff in the wind; but if you find the right starting point, and ask the right questions, the issues framed there from will be important and purposeful; your questions will be as a beacon of light illuminating a productive pathway. It leads to "progress" . . . . that ain't progress at all! 2) It complements the purpose and meaning of human existence. The following poem by Dr Matt characterizes matters that are "important" versus matters that are "urgent." always on the go . . . busy, hurried, harried. where layers of complexity peel away, . . . the pace relaxes. and no other time to live but . . . Now. Living Simply . . . Simply Living! (Changing Your Stripes, 2nd Edition, page 101). Dr Matt conceives the Win/Win relationship from this perspective: While most would assume that Win/Win is a cooperative function of TWO . . . and this is TRUE, still, Dr Matt sees this dyad as a function of YOU! You are bonded to others through meaningful, linguistic relations. this Verb aspect of Self is literally made possible by the presence of others. For this reason, Chauncey Riddle maintains, "The self is located in the space between two bodies." That "space between" is the communicative expression we give to others; messages of emotion and meaning that always require both sender and receiver. Your way of being IS this "space between," and exists through the interactive synergy of self-and-other. more than the Self-Image they Imagine. Every human act . . . has an impact. the human world is inherently a moral context. to their loss & detriment, in Bonds of Anguish, . . . I-It. The ultimate expression of "Win-Win" . . . means that each partner in the dyad impacts the other to their betterment, . . . not simply in terms of financial gain or better business . . . but to the long-term enrichment of the Bonds of Love. The fact is . . . two selfishly motivated colluders can arrive at mutually beneficial barters, . . . but the pinnacle of "Win-Win is characterized by selfless compassion, . . . and not merely selfish cooperation. In other words, unless we increase our integrity of character, we will not be able to "understand" others with consistent empathy and emotion. Further, using mechanical techniques of "reflective listening" (parroting and paraphrasing back the words we hear) is not equivalent to the kind of "understanding" that influences and inspires others to, in turn, want to understand our perspective. Selfish versus Empathic. Because we experience our world from a perspective located at our individual bodies, it is very common for one's way of seeing the world to have a default position that is inherently selfish. Selfishness IS the fuel that feeds the fires of human trouble. Comes the common quip, "how else can I live, but to live for my self?" And that is where conceptualizing the verb-self, or the self as "being," becomes centrally important. When we finally understand that the most vital and purposive aspect of self is manifest in our way-of-being-with-others, then an alternate possibility of looking at life emerges: Seeing the world through empathic eyes. What goes around . . . comes around. Because Life is Self-Correcting, if you fail to be empathic and see empathic early on, then Life will smack you hard in the head till your selfish attention is captured; and Life will keep on smackin' your egocentric head until you get the clue that it's time to Change Your Stripes and become a New Kind of Creature. A new you that is able to "Be" empathic, and thus naturally able to "See" empathic. Your Way of Seeing is inseparably tied to Your Way of Being. and Becoming a New Kind of Creature. One way of mentally dislodging Self from the chronic rut of ME-Centered-Seeing is to realize that the Animal You Are is not only an "I" to numerous "others," but also an "other" to numerous "I's." To remember this "out of body" perspective is to begin to desire the sweet fruits of empathy--the rich relations of love. And with "desire" . . . a seed is sown. "Karma" is a principle that supports and explains the 5th Habit: As we send out "understanding," . . . only then can "understanding" return to us; which is a principle parallel to the Law of the Harvest: We must necessarily sow the seeds of understanding . . . in order to reap the fruit of understanding. When you are being empathic you are not only being Loving, your very Being IS Love. "Being Loving" IS the highest attainment of purpose and existence: Love is the ultimate of Godly attributes. and can only fly embracing each other." We literally require each other in order to "be." And because of this bond, we stand before one another in an inherent position of moral obligation. As Mother Teresa put it: "If we have no peace, it is because we have forgotten that we belong to each other." How we are "being-with" others, our way of being, is the most important facet of self and the most essential expression of our existence. but spiritual beings having a human experience." The Fountain from which Emotions Flow. The foundational source from which all emotions flow is not spoken of in psychology texts or in scientific literature generally: That foundational source is "spirit." Spirit is not as mystical as some imagine; it is no more mysterious than the occurrence of "wind." While we don't "see" wind (the substance of which is invisible air in motion), we do empirically experience the effects of wind all around. Similarly, phenomena associated to the word "spirit" are as discernible to the senses as "wind." The consequences of spirit influence are readily perceive-able in the mortal realm, yet the direct substance of spirit remains invisible to mortal eyes—notice I said, "substance of spirit." Some conceive spirit to be immaterial, without form or matter, but this is not so! People who have visited the spirit realm consistently convey accounts of "seeing" some-thing . . . as opposed to no-thing; they viewed a world of substantial things and embodied beings. * Be True to your own Intuition of Truth OR . . .
* Betray that Spirit Intuition. 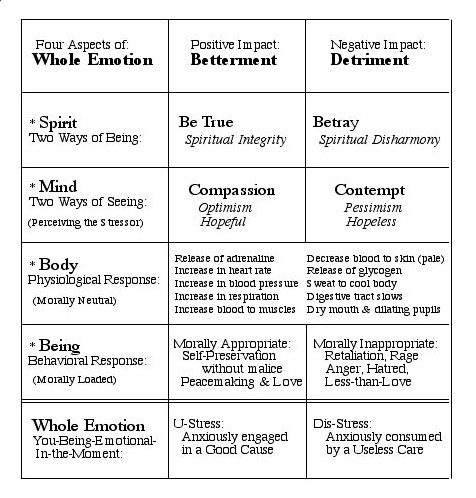 Understanding Whole Emotion by Matt Moody, Ph.D.
is nothing pure; but even their mind and conscience is defiled." (Titus 1:15). The way you perceive any particular moment in time is determined by how you are being in that moment--whether of Integrity or Disharmony. This is why the Sioux Indian holy man Black Elk said: "It is in the darkness of their eyes that men get lost." C. Terry Warner adds "When we cannot see our way, we think darkness is shrouding our pathway, when really the darkness is in ourselves." When we live in spiritual disharmony, we see the world differently, we see the world through darkened eyes; hence, we bring to particular situations our dark definitions, not because the situation is dark, but because we are dark. We get lost in shadows of our own creation, and it follows that dark emotions flow from impure perceptions. For this reason "emotions" should NOT be followed. you should not follow your emotions. (Changing Your Stripes, page 3-78).